First up is the make-up ‘essentials’. Now normally i’ll carry around a make-up bag with me everyday, but sometimes you just don’t need it. Recently I’ve been trying to only carry around a couple of products that I know will perform if I need them. First up is a powder, I like having the Maybelline Super Stay 24 Hour Waterproof Powder* in my handbag. Don’t worry, I’m not giving up my long love affair with Rimmel Stay Matte, this is just more handbag friendly. It’s a sturdy compact with a good quality mirror and comes with a little applicator pad, so no brushes needed. It’s also actually a very good, long lasting powder. The coverage is a little heavier on me than the stay matte, but that’s perfect if I’m wanting to amp up my complexion at short notice. I always feel a little more prepared for anything if I have some form of liner in my bag, and the Urban Decay 24/7 Pencil in Rockstar* is perfect for more or less everything. Its a browny/plum shade with a subtle sheen that’s really flattering and buildable on the eyes. Great in the waterline or smudged out for an on the go smoky look. 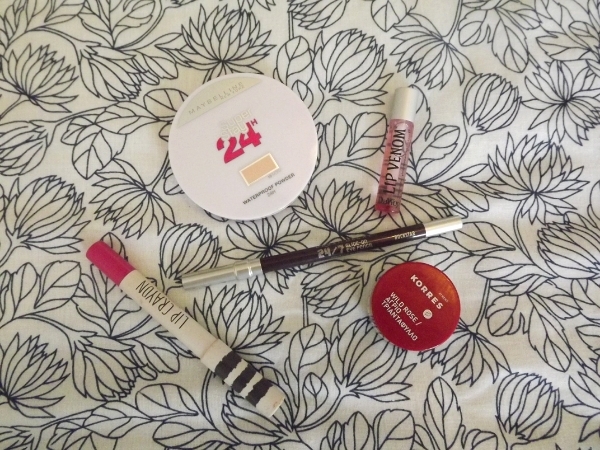 Last up for make-up is every girls handbag friend, lip products. I don’t know how many times I’ve emptied my bag and found an obscene amount of lip products lurking in the bottom. I have three that I like to keep in my bag, the Korres Wild Rose Lip Butter which can be smoothed on to create a very subtle healthy rose glow to the lips, or really built up to create a dark dramatic lip, perfect for this time of year. My beloved Topshop Lip Crayon in Clueless is my fail safe statement lip shade. This suits us dark blonde/light brown haired girls perfectly and never fades. If I want to get noticed in a hurry I pop this on. Lastly on the rare occasion I want to gloss things up then I reach for this perfectly sized Du Wop Lip Venom, this stuff is seriously plumping and seriously glossy, to be used only on very glamorous occasions. Moving on from make-up and onto my other favourite handbag essential, scents. Now in the past I have been very guilty of having a couple of bottles of perfume in my bag, which there really is no need for. 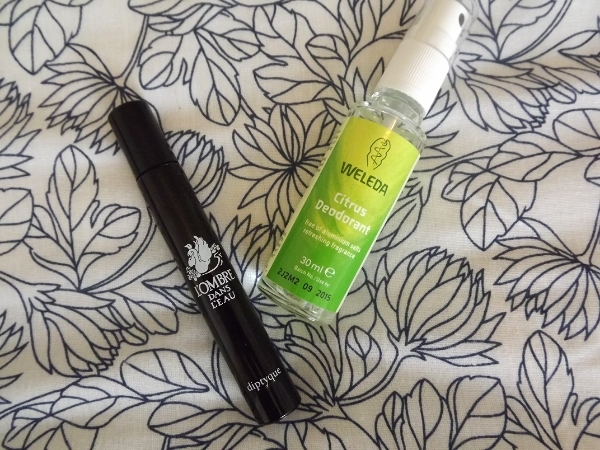 So I’ve whittled it down to two, for freshening up I love the Weleda Citrus Deodorant*, a handy sized natural deodorant with a very strong scent that’s refreshing and uplifting, and also very discreet in application. Then my Diptyque L’Ombre Dans L’eau rollerball perfume, which is just gorgeous. Strong, sophisticated and perfectly handbag friendly. 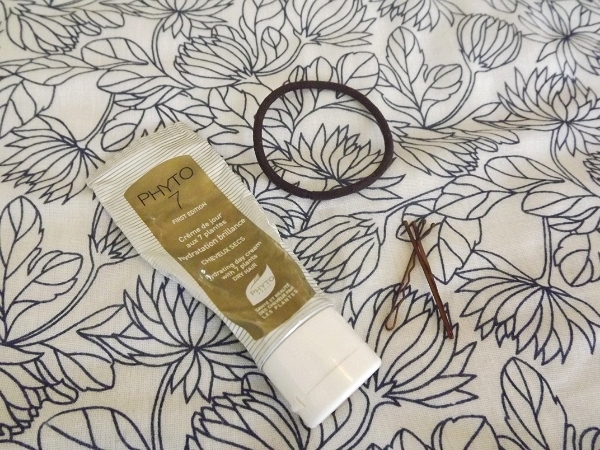 I’m pretty low maintenance when it comes to hair but the usual suspects such as a bobble and some kirbies can always be found more or less everywhere in my handbag alongside the Phyto 7 Hydrating Hair Cream, which has been a complete game changer for me. This stuff is amazing, if you haven’t tried it then you have to! A teeny bit of this worked through the ends of my hair adds an instant moisture boost and my hair looks healthy and perfectly groomed, and again you don’t need any mirrors or faffing around to apply this. 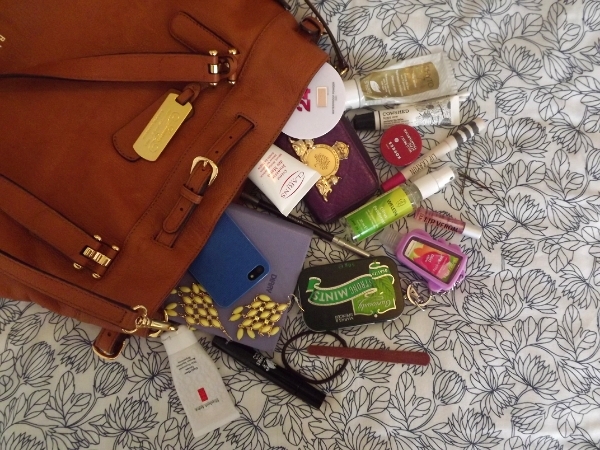 There are just some products that you know will always be staples in your handbag and the Elizabeth Arden 8 Hour Cream is probably my most used handbag product. I don’t think there is anything this can’t be used for, however, when I do want a lip balm that smells really good then I make sure I have the Cowshed Lippy Cow Lip Balm handy. 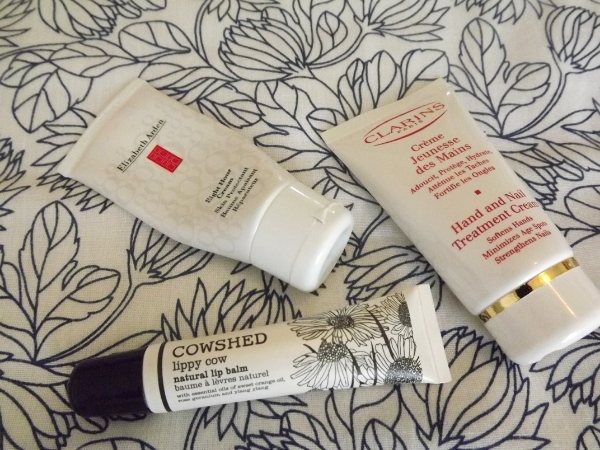 I’ve loved the Clarins Hand and Nail Treatment Cream for years now, and I love how you always get these handy little mini versions in the gift with purchase deals. This is the best hand cream in the world, and that’s a pretty bold statement coming from a beauty addict. Last but by no means least are the little touches that make all the difference. Mints, simple but very effective as you never know when you’ll need one. My favourites are the Curiously Strong Mints from M&S. On my trip to Vegas this year I went a little hand sanitizer crazy in Bath and Body Works, but this really IS a handbag essential, especially if you’re out and about all day, this is the Bath and Bodyworks Sweet Pea scent and I love it. Then finally I have a nail file, some cotton buds which are great for fixing makeup errors, creating smoky eyes and just generally handy and a pair of statement earrings from Wallis in case I’m going for a last minute hair up look and need something to add a little drama to my outfit.